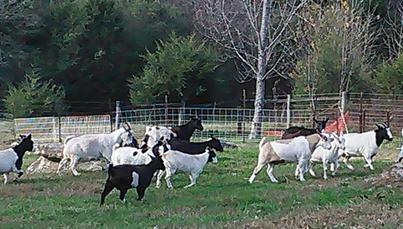 As a local breeder in Marshall Co. Tennessee, I have bread Myotonic Tennessee Goats for over 11 years. My Goal has always been to keep the breed as pure as possible, 100% myotonic. Myotonic goats make great pets, excellent lawnmowers and are always there to give us a good laugh! I am a member of the MGR. Myotonic Goats are a wonderful bred that I believe needs to be preserved. Fainting goats are listed in the American Livestock Breed Conservancy's Conservation Priority List. It is important to preserve this rare breed, and easy to do so, given that fainting goat's fit to most of America's climate. We hope you enjoy our site and we look forward to hearing from you. No matter what stage of ownership you are in; youth, first time owner, or established breeder, we have the goat for you.